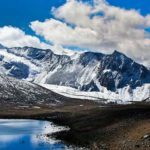 This trek offers a great variety of trekking conditions, from picturesque farmland and forests to alpine pastureland and high passes. Shingche La at 5,005m is the highest pass that you will cross on this trek. There is an ample chance to spot yaks, blue sheep, vultures and rare birds. Depending on the time of year, you will also see large herds of takins in the forested valley of Tsherijathang. Spectacular campsite, beneath some of Bhutan’s most impressive peaks, of which the most notable are Jumolhari and Jichu Drake, are also the features of this trekking route. Numerous isolated Dzongs and scattered settlements, including the outlandish village of Laya, provide a great deal of cultural interest en route. Season: This trek is generally open from April to June and mid September to mid November. However the best trekking month in Laya region is April. Upon arrival in Paro, you will be greeted by our representative and transferred to your hotel. After lunch in the restaurant, you can visit the Paro Dzong. It was built in 1646 and now houses government offices and religious institutions, as do all the Dzongs (forts) currently. 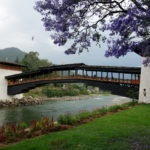 You’ll cross a traditional wooden bridge on the way to the Dzong. Afterward you will visit Kichu Lhakhang, the oldest temple in the country. From there you will be taken to the Drugyal Dzong (Bhutan Victory Fort), which was built in 1646 to commemorate Bhutan’s victory over Tibetan invaders during the 1600s. On a clear day you can see Mount Jumolhari, Bhutan’s second-highest mountain at 7,329 meters, from the village below the Dzong. In the evening you can stroll through the Paro market and town. Overnight at the hotel in Paro. After breakfast, full day excursion to Taktsang or the “tiger’s nest” perched precariously on the cliff 900m above the floor of the Paro valley. It is the most famous monastery in Bhutan. It is said that Guru Rimpoche have flown to the site of the monastery on the back of a tigress and meditated here for three months. Lunch would be served in the Cafeteria. Return to Paro in the evening. Overnight at the hotel in Paro. Trek begins: Drive up to Drukgyal Dzong where the road ends and start the trek by following the river gently uphill through a narrowing valley of paddy fields. You will find plenty of traditional farmhouses in a purely rural setting. The campsite is just beyond an army outpost. Alt. 2800m, Distance – 17 km and time 5-6 hours. Continue uphill through the river valley, which narrows and closes in after some distance. The trail then winds up and down along the drainage. Most of the trail actually is down hill after the initial climb. The campsite is located in a meadow with stone shelter. Alt. Approx. 3400m, distance 15 km, time 4-5 hours. Walk up along the Pachu (Paro river), pass a small army outpost where the valley begins to widen again. You can now clearly view the high ridges and the snow-capped mountains all around and also see the yaks and the yak herder’s winter homes. Camp beneath a ruined fortress at the base of the Jumolhari Mountain. Alt. 4040m. , Distance 19 km and time 5-6 hours. Walk up toward the pass through a wide pastureland. Depending on the season you are there, you might find some yak herders in their camping tents along the way. As you come down after the pass to the Lingshi basin, you will see some beautiful views of the Lingshi Dzong, valley, Tserim Kang (mountain) and its descending glaciers at the north end of the valley. Camp in a stone shelter with a built-in fire pit or in the tent. Alt. 4150m. Distance 19 km. Time 5-6 hours. Today is the shortest walking day and you can really take it easy. On reaching the campsite at Chebisa, you can visit the village houses if you feel up to it. Alt. 3850m. Distance 12 km. Time 3-4 hours. You walk through a wide pastureland towards Gobu-la (pass). On the way, you will see few people herding the yaks. After crossing the Gobu -la (Alt. 4350m) descend down to the valley. The campsite is on a bench above a river, which is a tributary of the Nochu river. Alt. 4260. Distance 17 km. Time 5-6 hours. As the walk is little strenuous, it is advisable to start little early. After crossing the Jerela (pass) alt. 4600m you come down to Tsharijathang valley where you can normally see herds of Takins. Camp at Tsharijathang. Alt.4390m. Distance 15 km. Time 6-7 hours. After crossing the Shingela pass, alt. 4900m, you come down and follow the valley. Lingmithang is under the Laya District and you will see people dressed in typical Laya costume with long pointed bamboo hats on their head. Camp at Lingmithang. Alt. 4140m. Distance 19 km. Time 6-7 hours. If you have time, it would be advisable to spend a day here exploring the valley and meeting the people who have a different and unique culture. Today, you walk all the way downhill along a narrow winding river valley. The trail leads you to the west side of Laya village. Campsite is on a high flat bench above the Laya village. Alt. 3850m. Distance 10 km. Time 3-4 hours. Rest and explore the Laya village. The trail winds up and down along the river valley avoiding natural obstacles and affording breath-taking views of the crashing river, feeder streams and water falls. Camp. Alt. 3800m. Distance 19 km. Time 6-7 hours. You cross the Babela pass, Alt.3740m, after which the trail is all the way down till you reach the campsite which is close to Gasa Dzong. Alt. 2900m. Distance 17 km. Time 6-7 hours. After a late breakfast, trek to Gasa Tsachu. After lunch relax in the hot spring. The Gasa Tsachu is one of the most popular hot springs in Bhutan. Camp at Gasa Tsachu. After a short climb, the trail winds through the rolling hills and passes through the pine and oak forests, villages and wheat fields. You will also see a beautiful view of the Gasa Dzong glued to the valley wall seeming to float in space. Arrive Damji. Distance 18 km, 5-6 hours. Your car will be waiting here to transfer to Thimphu. You will drive through the high agricultural benches above the Mochu (Chu means River) into a lush semi-tropical gorge filled with banana trees, creepers and various tropical vegetation till Tashithang. Continue driving to Punakha. Overnight at the hotel in Punakha. After breakfast drive for half-hour to Wangdue. Wangdue town which is a typical small Bhutanese town, with bustling market and well stocked shops. Visit Wangdue Dzong, the 17th century monument. It sits atop a high ridge between the Puna Tsang Chu and the Dang Chu. The place is also known for its fine bamboo work, slate and stone carvings. Also visit the Rinchengang village on the opposite side of the river, which is a unique cluster of houses made up of red mud. The people of this village are of Indian origins, who originally were brought into Bhutan as construction workers of the Dzong (fortress). In the evening drive back to Punakha. Overnight at the hotel in Punakha. Set out for Thimphu with a stop in Dochu La for tea. 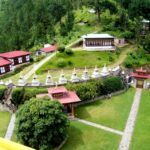 Visit the new Druk Wangyal Monastery, which is the only of its kind in the country with elaborate paintings depicting the lineage of the present monarchy and their visionary works. Continue drive to Thimphu and check into your hotel on arrival. Overnight at the hotel In Thimphu. Visit the Memorial Chorten (a huge stupa) built in memory of the third king who reigned the Kingdom from 1952-1972. Visit the National Library where ancient manuscripts are preserved. Visit the Wood Craft and Painting school where traditional arts and crafts are still kept alive. Visit the Handicrafts Emporium where Bhutanese textiles and other arts and crafts are displayed and can be purchased. Visit Simtokha Dzong. This is one of the oldest fortresses in Bhutan. It was built in 1629 AD. Visit Tashichho Dzong, the main secretariat building. This massive structure houses part of the government Ministries, the office of the King and the Throne Room. It also houses the State Monastic Body, living quarters of the Chief Abbot and the senior monks. Overnight at the hotel in Thimphu. In the morning you can hike to Tango Monastery, which was built by the “Divine Madman” in the 15th century. It’s a center of study for monks, and it affords a great view of the Thimphu Valley. Drive back to Thimphu and after lunch you will proceed to Paro. Overnight at the hotel in Paro. After breakfast, you will drive to Haa Valley across Chela Pass 3810m. On the clear days you will have views of Mount Jumolhari and other mountains and valleys below the pass. Explore nearby mountains dotted with colorful prayer flags and blanketed with dwarf rhododendrons. If you want to be more adventurous you can hike further down the ridges to Kila Goempa Nunnery, which is nestled in a craggy patch on the mountain site below the pass and perched precariously along the rock face. After a picnic lunch, you will drive to Paro. Overnight at the hotel in Paro. Drive to Paro Airport. You will be seen off by our representative.